AT&T is entering the most affordable 4G 10-inch tablet yet into the market contest this week with release Sunday of the Acer Iconia Tab A501. That should stir up the competition among 4G tablets, which include the rival Samsung 4G Galaxy Tab 10.1 on Verizon, as well the pricey HTC Jetstream on AT&T. 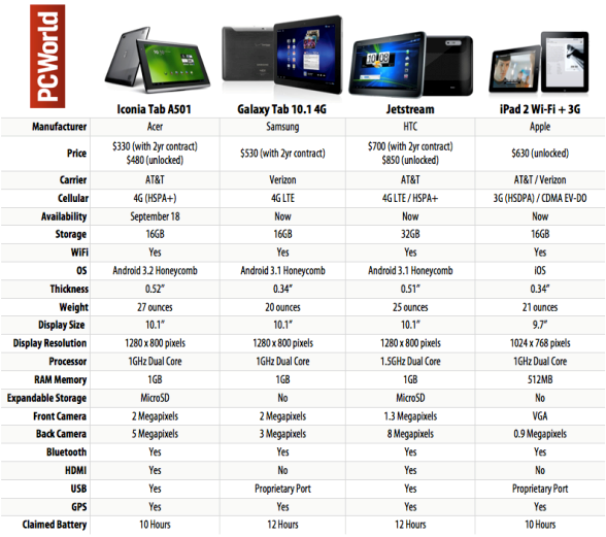 Of course, no tablet comparison is complete without considering Apple's iPad 2. 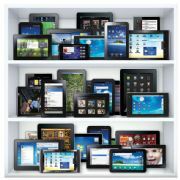 It lacks 4G capabilities, but remains the most popular tablet with consumers to date. If you’re in the market for a 4G 10-inch tablet, chances are you’ll have to get a two-year contract with your carrier of choice: AT&T or Verizon. The Samsung Galaxy Tab 10.1 comes for $530 on Verizon, while AT&T offer the HTC Jetstream for $700 ($850 unlocked) and the Acer Iconia Tab A501 for $330 ($480 unlocked). You can’t get the iPad 2 with a contract, so that’s $630 with either Verizon or AT&T. Besides the Jetstream, all tablets come with 16GB of storage (Jetstream has 32GB). You’ll also want to look into the connectivity options: The Galaxy Tab runs on Verizon’s 4G LTE network and so does the Jetstream on AT&T’s LTE network, but the Iconia Tab works only with HSPA+ -- still fast, but not as fast as LTE. Data pricing is also something to seriously consider, as this can get very taxing: the Jetstream needs a minimum data plan of $35 per month for 3GB, while the Galaxy Tab starts at $30 per month for 2GB ($50 for 5GB, $80 for 10GB). With the Iconia Tab, you can either get a monthly plan, or prepaid -- $15 gets you 250MB and $25 hikes your allowance to 2GB (no overage fees on a prepaid plan). The HTC Jetstream is the most expensive 4G tablet, but it’s also the most performing (on paper). It has a 1.5GHz dual-core processor, while the Iconia and Galaxy Tab also run on dual-core processors, but at 1GHz. All three tablets come with 1GB of RAM and 10.1-inch displays at 1280 by 800 pixels. The thinnest and lightest 4G tablet is Samsung’s Tab 10.1, which is just as slender as the iPad 2 (and slightly lighter). The Iconia Tab and Jetstream are just more than a half-inch thick, and weigh 27 and 25 ounces respectively. The Jetstream and the Galaxy Tab run on Android 3.1 Honeycomb, while Acer’s Iconia A501 will come with the slightly improved Android 3.2 (Samsung’s and HTC tablets are set to receive the same update in the near future). The Jetstream has an 8-megapixel shooter on the back and the Iconia Tab has a 5-megapixel camera, while the Galaxy Tab comes in at 3 megapixels. Compared to the iPad’s cameras, the Android tablets win by a long shot. The Acer and HTC tablets also feature MicroSD slots for additional storage, while Samsung’s Galaxy Tab follows the iPad, with a lack of expandable storage and a proprietary USB port. As an added bonus, you’ll find an HDMI port on the Jetstream and A501. If you’re looking for the best value 4G tablet, the Acer Iconia Tab makes up for its bulkiness and slower 4G radio with its price, which even unlocked, is still the least expensive. If you want 4G LTE on AT&T, the only other option is the Jetstream, which despite its performance, is priced at more than double the cost of the A501. Meanwhile, Samsung’s Tab 10.1 strikes a fine balance between performance and price and runs on Verizon’s more widespread 4G LTE network.